Here we go. Monday 16th January 2017, 9am Geneva time. The SIHH 2017 is officially opened and what could be better than this A. Lange & Söhne Tourbograph Perpetual Pour le Merite to sound the start of the show. In short, this watch is simply mega. 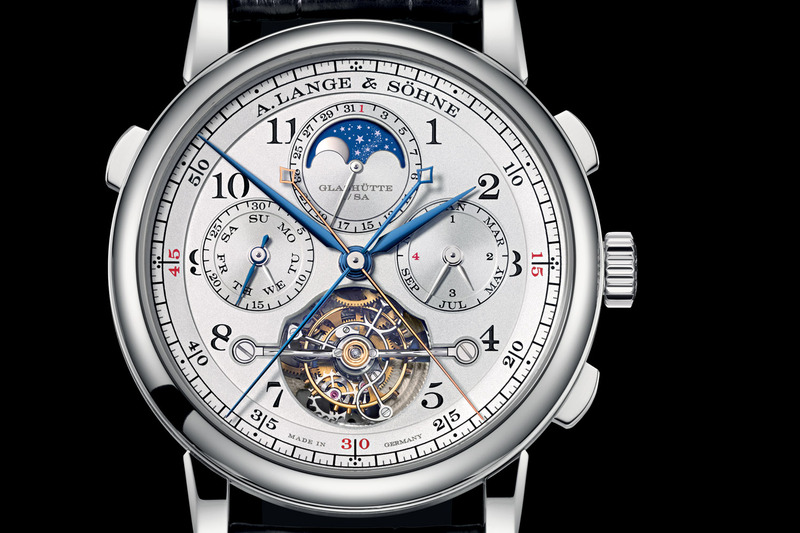 If you have been into watches for already a few years, you might be aware of the 2005 A. Lange & Söhne Tourbograph Pour le Merite, an impressive watch combining a tourbillon, a split-seconds chronograph and a fusée-and-chain transmission. Add to that a perpetual calendar and you’ll have one of the most impressive watches ever created by the Saxon Manufacture (after the Grande Complication), which is the brand’s highlight for his year. 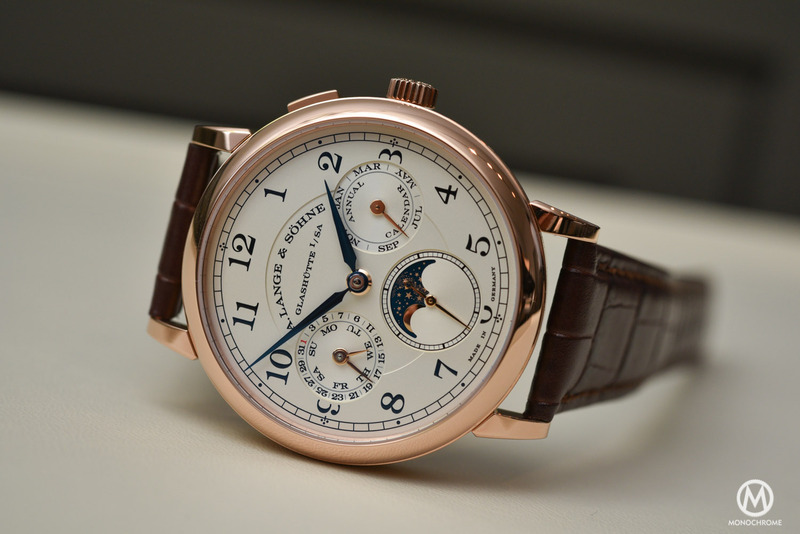 Here is the A. Lange & Söhne Tourbograph Perpetual Pour le Merite. 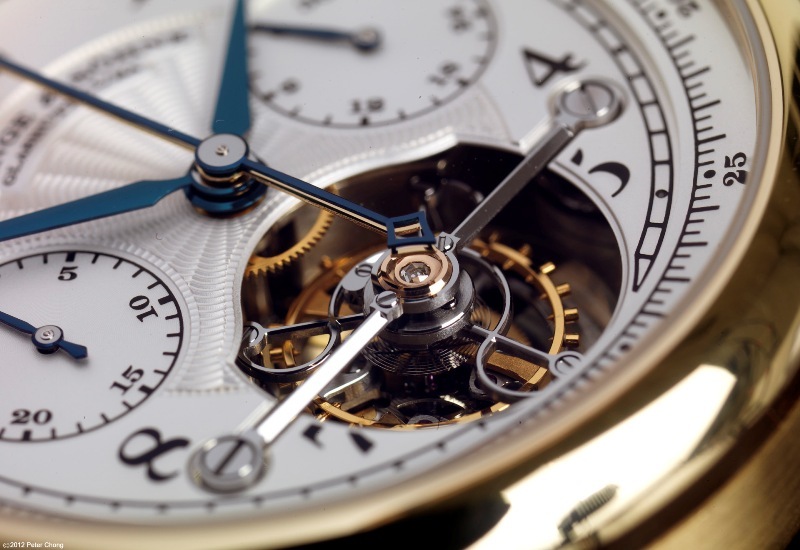 Back in 1994, 4 watches marked the resurrection of a manufacture named A. Lange & Söhne. This early collection included the Lange 1 (a watch that is still in the catalogue and that can be considered as the corner stone of the collection) and the Tourbillon “Pour le Merite”, actually the first wristwatch to combine a tourbillon regulator with a fusée-and-chain transmission. Later, in 2005, it was followed by another watch combining these two complications, and additionally featuring a split-seconds chronograph (also named a rattrapante). This watch remained as the manufacture’s most complex timepiece until the introduction of the Grande Complication in 2013. While many still remember this watch as a masterpiece, it has not been in the collection for some years already, and we all looked at it as a untouchable grail. Well, that was until the opening of SIHH 2017, and the re-introduction of the Tourbograph. However compared to the previous edition, there’s even more on offer now. 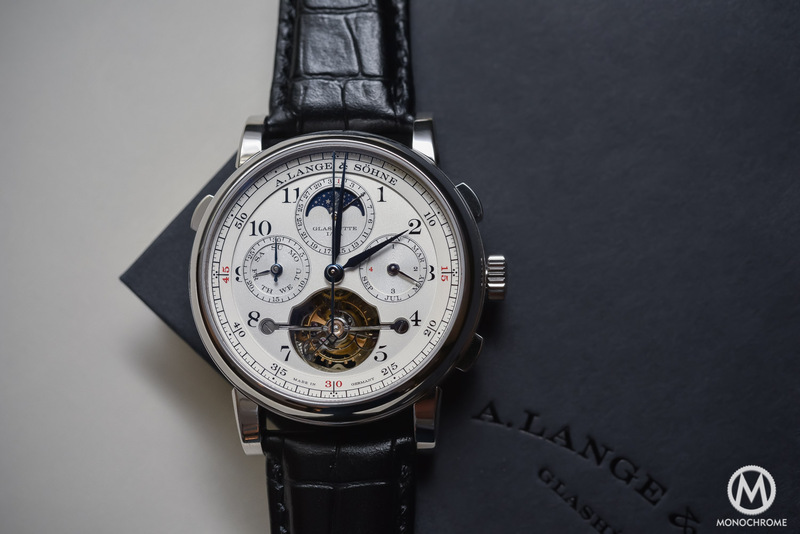 And with this A. Lange & Söhne Tourbograph Perpetual Pour le Merite, the new issue was to integrate a perpetual calendar together with a tourbillon – which of course, requires a hole in the dial and in the main-plate. But before solving that challenge, let’s take a look at the several features of this watch. The A. Lange & Söhne Tourbograph Perpetual Pour le Merite is indeed highly respectful of the traditional codes of the Saxon manufacture. Dial, case, display, colors… everything recalls the older version of the Tourbograph and the current collections of the brand, although the watch has been slightly modernized. First of all, it comes in a larger case, measuring now 43mm (instead of 41.2mm) with a thickness of 16.6mm. Overall, it is a large piece, but not especially larger than a more simple (if we can say so) Double Split, which measures 43.2mm x 15.3mm (and that watch doesn’t have a tourbillon, a QP and a fusée-and-chain, but only a rattrapante chronograph). The case of this new Tourbograph is in 950 platinum. As for the dial, thanks to the larger diameter, the integration of the perpetual calendar is rather well done. Compared to the previous model, the layout remains rather sober and legible, the QP being integrated into the sub-dials at 3 and 9, and the moonphase and date counters being classically placed at 12. One thing to note is the absence of the power reserve indicator, which was placed at 3 on the original model. Instead, the counter at 3 displays the leap year and month, while the one at 9 gives the indication of the 30-minute counter and of the day of the week. We also note that A. Lange & Söhne decided to go for a clean dial, removing the guillochage on the central part. As usual, most hands are blued, at least for timekeeping indications. The rattrapante hand is gold in order to be easily identifiable (this was also the case on the old “Toubo“). Finally, we note that the larger diameter allows for a more opened dial and a more aerial look. 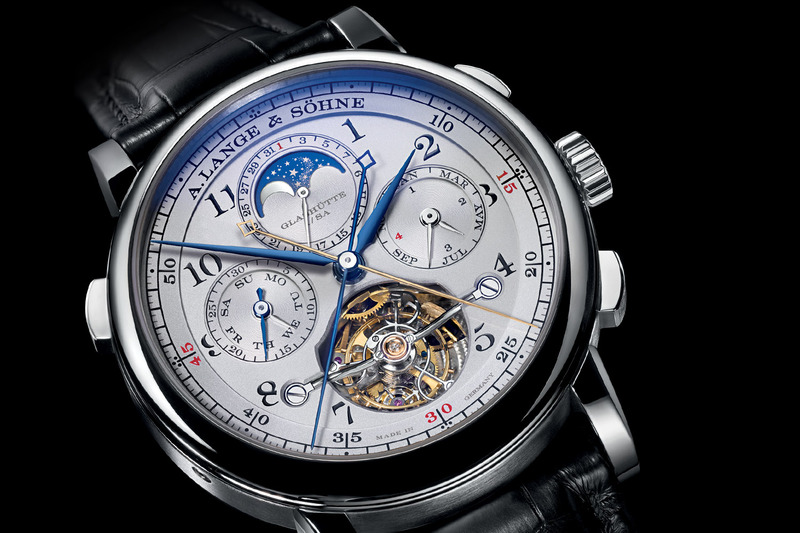 This is the main novelty of this A. Lange & Söhne Tourbograph Perpetual Pour le Merite. It now features a perpetual calendar. Still, even if Lange has already several QPs in the collection, this one was not an easy task in terms of development. Indeed it comprises no less than 206 parts. Because the Tourbograph has a tourbillon and and a number of hands running on the dial, a classic perpetual calendar was not possible. Lange had to redesign the base calibre of the Tourbograph and to add a specific module (which was built around the tourbillon) on top to be sure that the interaction of the parts was perfect. One of the main features of the Tourbograph Perpetual Pour le Merite is that it’s not only a chronograph but a rattrapante chronograph. Such a chronographs allows the wearer to calculate intermediate intervals of time, by stopping an additional hand that stops when a pusher is pressed, and that will catch up to the main chronograph hand when the pusher is pressed again. Technically, this means a highly complex mechanism, relying on two column-wheels (visible on the back side). Apart from the two chronograph pushers on both sides of the crown, a third button at 10 o’clock indicates the presence of such a device. 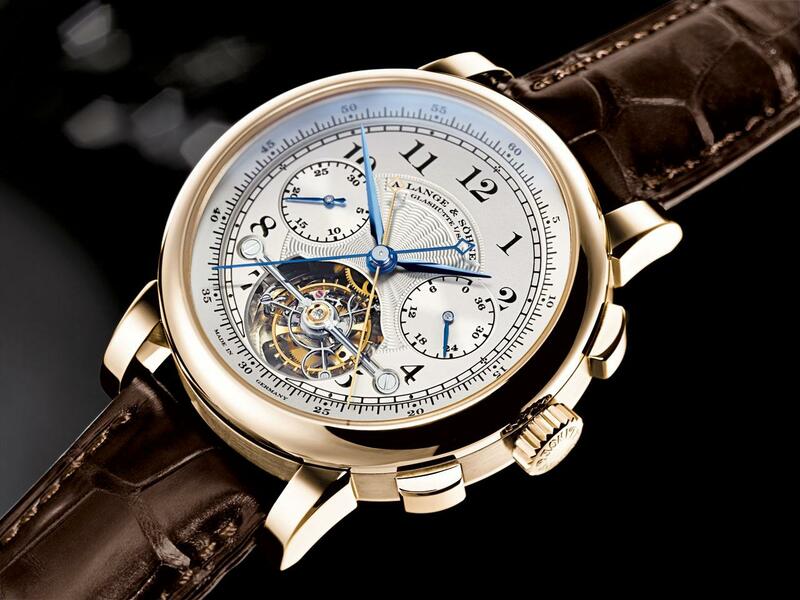 The combination of a perpetual calendar with a split-seconds chronograph is rare. Power management is an especially challenging undertaking. In particular, the simultaneous use of several functions calls for mechanical ingenuity, for instance when the calendar indications advance around midnight and the stopwatch function is used at the same time. Assembling such a movement requires considerable experience and exceptional sensitivity when adjusting and harmonising the mechanisms. Whilst a split-seconds chronograph and a perpetual calendar are great features, they nevertheless remain display functions. 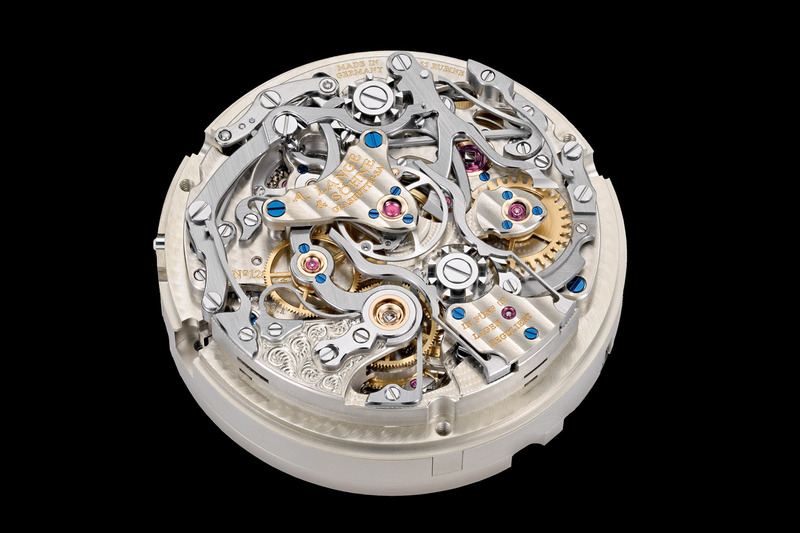 What about one of the most complex research fields of watchmaking – accuracy – in this watch? Well, to guarantee improved precision, not only at a certain time and position, but also over the entire duration of the power reserve, Lange integrates here two superb complications; a one-minute tourbillon and a fusée-and-chain transmission. These two combined will offset two disruptive phenomena in a mechanical movement: gravity and waning spring force. The tourbillon first aims at increasing precision by fighting gravity, as the balance and escapement are constantly changing position. Classically placed at 6 and making one revolution per minute, the tourbillon is held in place by a black polished bridge, a finishing technique that is being applied for the first time on a curved surface (indeed, the arms of the bridge are not flat but they go down into the dial, to compensate for the height of the perpetual calendar module). Real connoisseurs of fine watchmaking will appreciate this. Then there’s the fusée-and-chain, a complex device that aims at creating a more constant force delivered by the barrel to the escapement of the watch, smoothing the torque that is received by the escape wheel over the whole length of the power reserve. A fusée consists of a cone-shape pulley, linked to a chain coiled round the barrel. The fusée features a spiral thread to receive the chain. Thanks to the increasing circumference of the thread, the diminishing force of the mainspring is compensated. 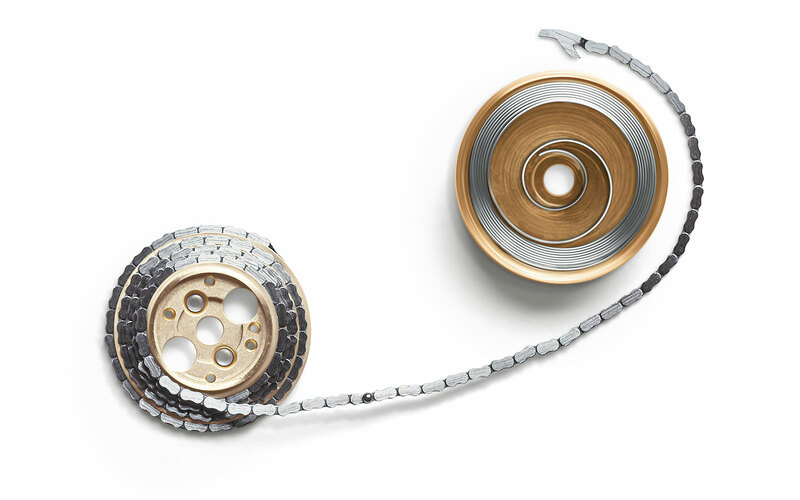 As the mainspring unwinds, the chain rolls on the barrel and off the fusée. The increasing leverage of the fusée compensates for the waning torque of the barrel. 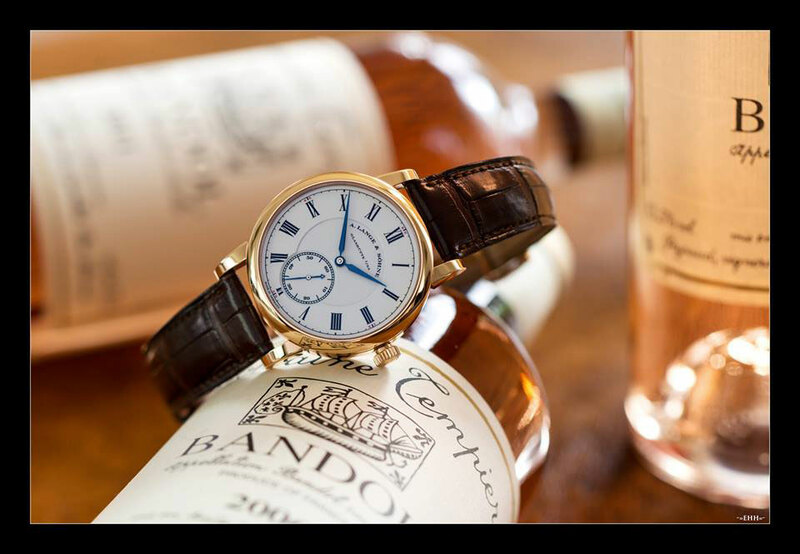 It is the technical hallmark shared by all Lange timepieces identified by the attribute “Pour le Mérite” since 1994 and the Tourbillon Pour Le Merite. The chain of the Tourbograph Perpetual comprises no less than 636 parts. The power reserve is 36 hours, as most “Pour le Merite” watches from the brand, even though it is now fitted with several additional complications. 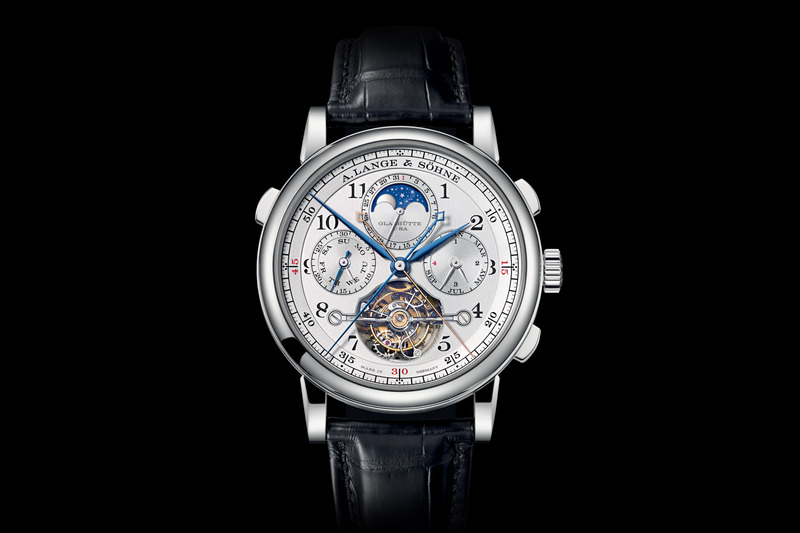 The A. Lange & Söhne Tourbograph Perpetual Pour le Merite follows a series of highly impressive watches from the Saxon manufacture, including the 1815 Rattrapante Perpetual Calendar, the Datograph Perpetual Tourbillon, the Zeitwerk Decimal Repeater (which for 2017 comes in a new rose gold version) and the massively impressive Grande Complication. 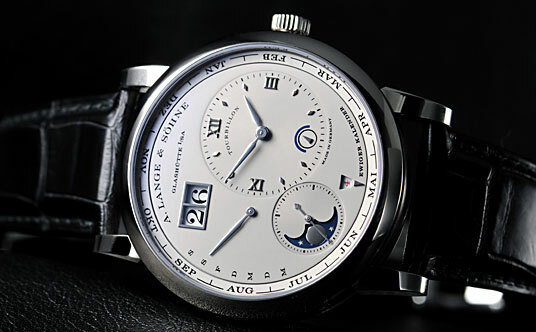 Once again Lange proves to be one of the most capable maisons, with astonishing watchmaking skills. 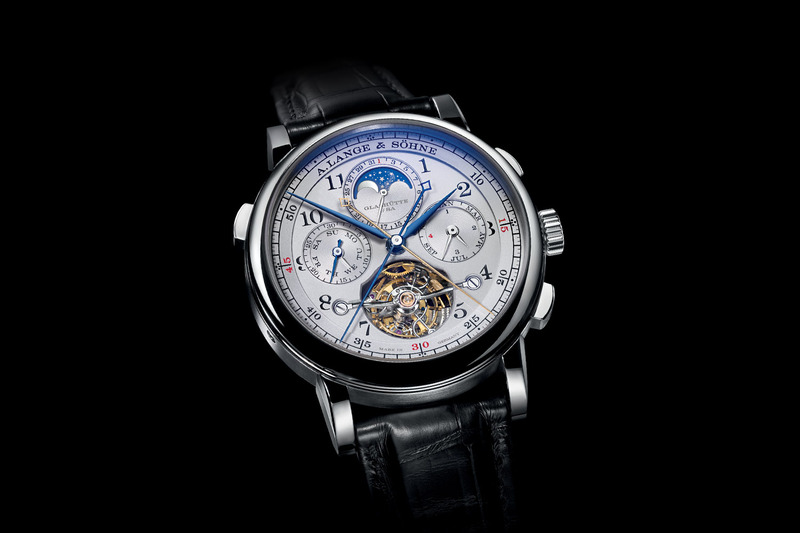 The Tourbograph Perpetual is a limited edition of 50 watches. Price: 480,000 Euro (German retail price, inc. taxes). alange-soehne.com. thanks for reporting in real-time….This piece is impressive, jaw-dropping…Might it be SIHH 2017 iconic piece ?